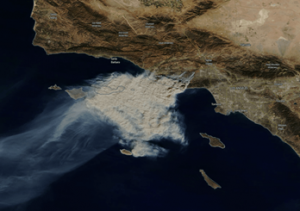 The SSFL, 30 miles northwest of downtown Los Angeles, was burned over by the Woolsey fire which by Nov. 13 had consumed 96,000 acres or about 150 square miles. The fire’s progress through to Oak Park indicates that much of the toxic site burned, according to the Los Angeles chapter of Physicians for Social Responsibility which has investigated SSFL radiation risks for 30 years. The July 12, 1959 partial meltdown of the Sodium Reactor Experiment (SRE) was especially dangerous, because, as an experimental reactor, it was built without a “containment structure” — the large concrete and steel dome the covers most nuclear reactors. The SRE loss of control was “the third largest release of iodine-131 in the history of nuclear power,” according to Arjun Makhijani, President of the Institute for Energy & Environmental Research. Like today’s uncontrolled dispersal of contaminants by the Woolsey wildfire, the amount of radioactive materials dispersed by the 1959 accident was never thoroughly measured. The lab’s radiation “monitors went clear off the scale,” according to an employee of Rocketdyne which operated the site. That meltdown was kept secret for 20 years until 1979. More than 60 studies have shown increases of childhood leukemia around nuclear facilities worldwide. Despite this finding, there has never been independent analysis in the US examining connections between childhood cancer and nuclear facilities. The US Nuclear Regulatory Commission (NRC) had directed the National Academy of Sciences (NAS) to conduct such a study, but then withdrew funding, claiming publicly that it would be too expensive. In fact, documents obtained through the Freedom of Information Act (FOIA) reveal that NRC employees had already determined the study would show no impact. Internal emails indicate that staff was presupposing a conclusion for which they had no evidence, demonstrated by statements like “even if you found something that looked like a relationship [between cancer and radiation], you wouldn’t know what to attribute it to,” and “most people realize that all the evidence shows you’re not going to find anything.” The evidence, however, had not yet been fully collected and examined. And studies in Europe found elevated rates of leukemia among children 5 and under living near nuclear power plants. NRC exposure data and computer modeling is designed to demonstrate compliance with the NRC’s regulations, but not to assess health impacts. The NRC has already stated numerous times that it believes low doses of radiation, the kind NRC claims its licensees are allowed to release, pose risks so low that health impacts may not be discernible. We don’t know if NRC’s claims of no discernible or attributable public health impact from nuclear power are actually true since no one has ever looked properly. Pregnancy and unborn children are the most vulnerable to serious damage from radiation exposure. Studies in Germany and France show an association between operating nuclear facilities and childhood cancer. However, given the demonstrable bias of the US NRC toward low doses having no health impact, it is essential that a US study go forward under the auspices of outside, independent experts, in order to examine what is happening in the US. To date, most radiation studies have routinely suffered from a host of improper methodologies, making it impossible to discern health impacts. The NAS was considering using new ways of examining the issue by implementing a more detailed, more thorough, publicly shared research protocol. 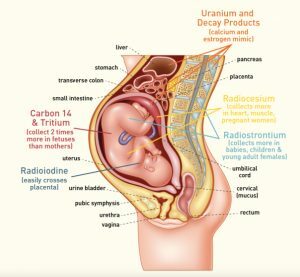 Creating new health models, specifically for the radionuclide carbon 14, which concentrates in fetal tissue more than maternal tissue. While the NAS child study design and protocol had much to recommend it, what’s unclear is whether it would have been free of all of the flaws that have historically plagued radiation health assessments. When the study was cancelled, independent experts still had concerns. To date, researchers have started radiation health studies by presuming that there will be no impact because doses are too low—a contention that, in reality, remains scientifically unproven. Many studies reveal the opposite. Any new such research needs to ensure that the basis for health assessments is a focus on health outcomes, not dose models that are fraught with uncertainties. While NRC licensees [like reactor operators] attempt to monitor environmental contamination, the NRC has never incorporated biological monitoring, which might prove useful after spike releases from various facility outages. There are several techniques that have been used in other health studies, which a revived cancer study could weave into any child or adult health assessment. —Cindy Folkers is the radiation and health specialist at Beyond Nuclear, in Takoma Park MD.